While at the Haven Conference, a conference for do-it-yourself bloggers and decor enthusiasts, I previewed a new collection of faucets by BLANCO called the EMPRESSA Collection. Each uniquely designed faucet in the collection is inspired by a vintage wine press. 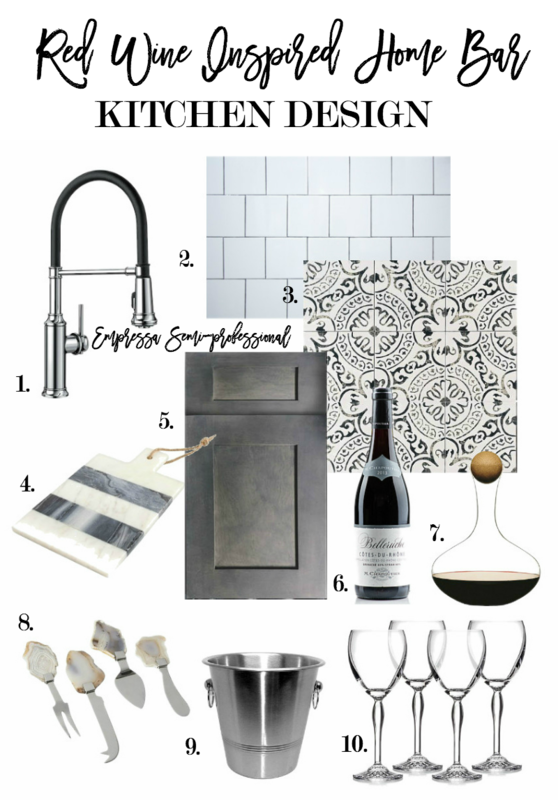 Today I’ll be sharing the four new BLANCO faucets with you along with my own wine-inspired, home bar design boards! Good design is always inspired by other beautiful design–and few things are more inspiring than a good glass of wine enjoyed in a beautiful setting! 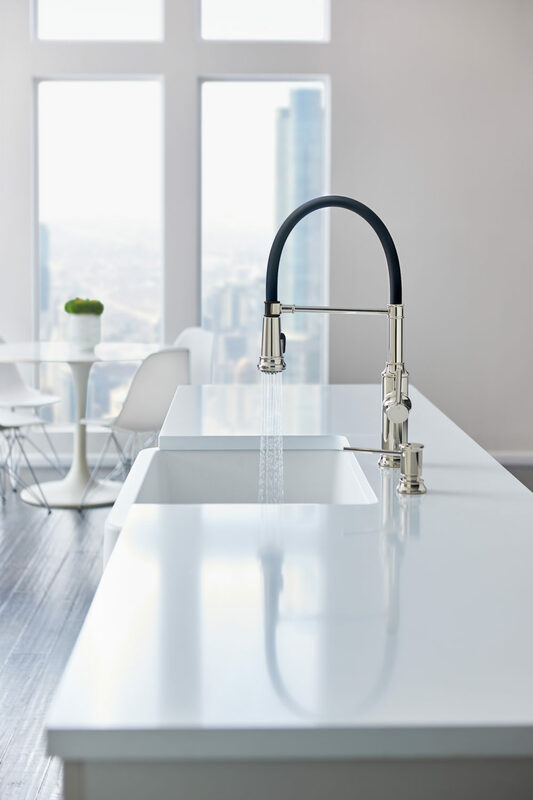 In their latest collection of kitchen faucets, BLANCO honors the company’s German heritage by channeling the wine making tradition of Europe into the design of each EMPRESSA faucet. You can especially see the inspiration of a vintage winepress demonstrated in the faucets’ handle. BLANCO recently hosted a special Facebook Live from De Gustibus Cooking School in New York City. They asked “The Wine Wise Guy” Anthony Giglio to help them pair wines and faucets. I thought it would be fun to take things one step further by creating wine inspired home bar design boards for each faucet and wine pairing! I hope this post inspires you to think outside the box when you are designing or redecorating a room. 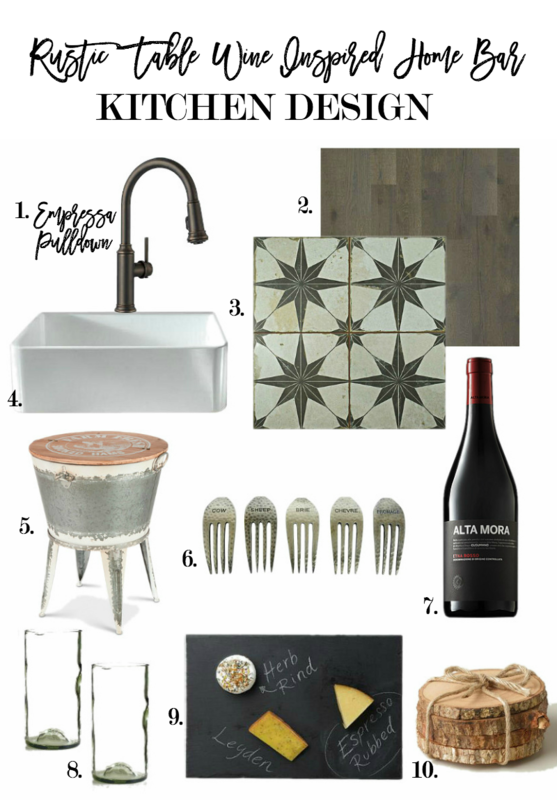 Inspiration for a room design can literally be inspired by anything you love, including good wine! The BLANCO EMPRESSA Bridge Faucet is my favorite in the collection! It comes in a variety of finish options including a classic polished nickel finish. It has a unique and practical pull-down dual spray head not often found in bridge faucets. This faucet is soft, elegant, sophisticated and works beautifully in traditional, French country, and modern farmhouse kitchens. Who wants to join me for a glass of Rosé in this gorgeous kitchen or home bar? I was inspired by the pairing of the EMPRESSA Bridge Faucet with Rosé to create a sophisticated and feminine home bar design. My design board includes light oak flooring, marble tile backsplash, pearl gray cabinetry, and bar accessories with hints of gold and blush. The EMPRESSA Semi-Professional Faucet is a professional style faucet with a flexible rubber hose that is easy to use and classic in design. 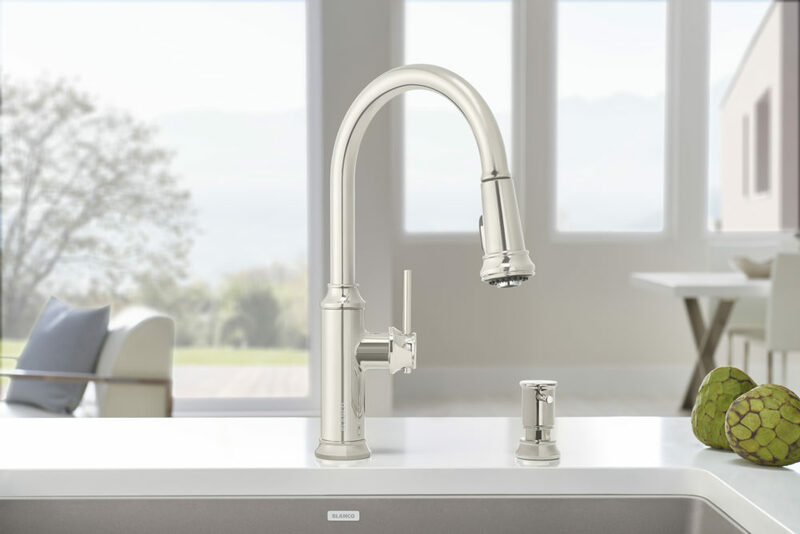 The faucet comes in several finishes, but my favorite is the stainless steel! 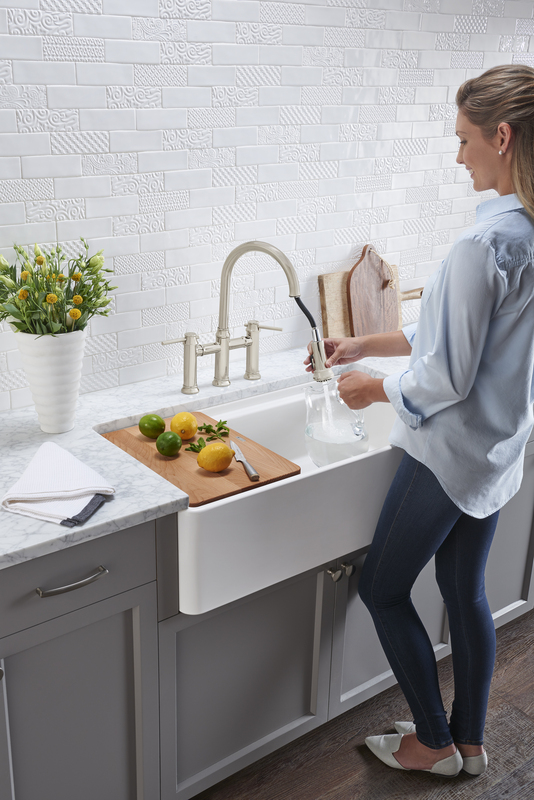 With it’s clean and classic lines, this faucet looks beautiful in many different kitchen styles including contemporary, transitional, and modern farmhouse. 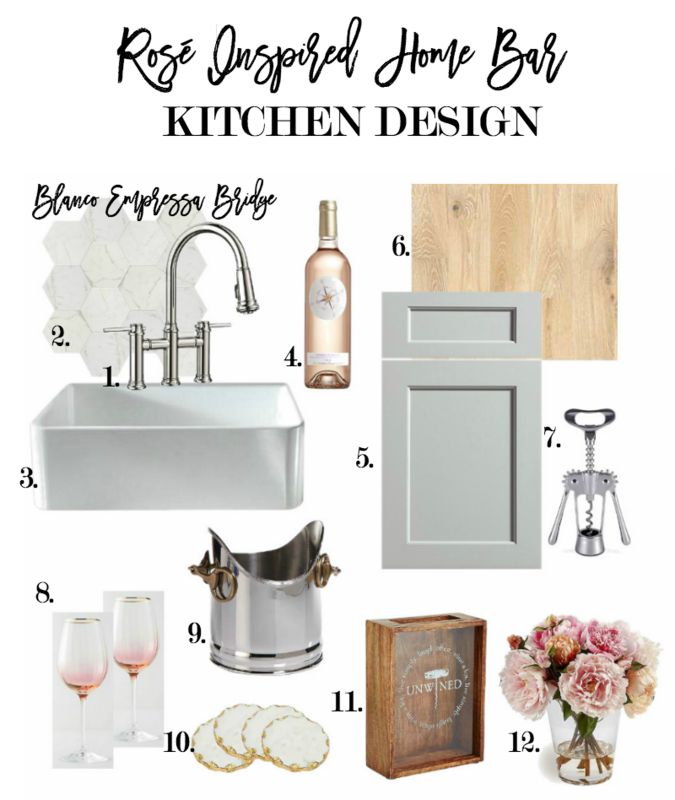 I was inspired by the pairing of the Chapoutier Belleruche Cotes du Rhone Rouge with the EMPRESSA Semi-Professional faucet to create a gorgeous modern farmhouse, home bar mood board. This faucet looks fantastic paired with the clean white backsplash and beautiful patterned flooring. The design is trendy, yet classic, with a wonderful balance of masculine and feminine elements. 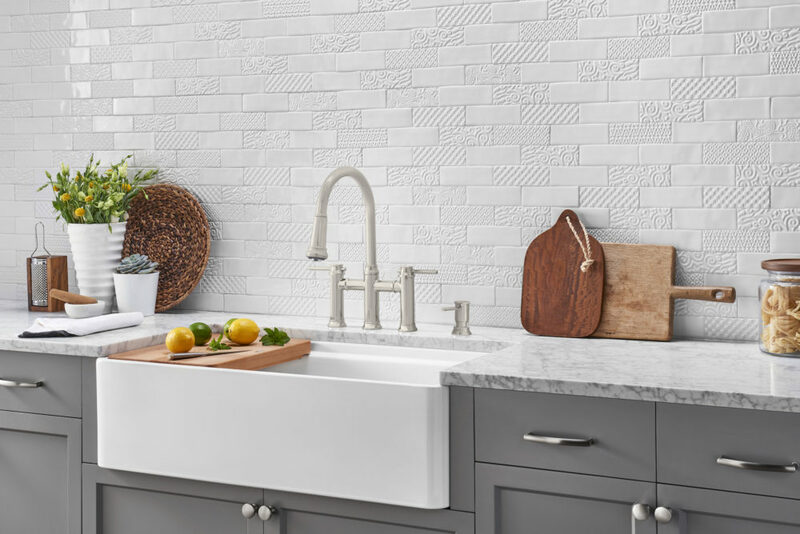 Take note of the white 4×4 offset square tile backsplash with black grout; it is an affordable trend right now that seems to be replacing the ever-popular subway tile backsplash. The body of the EMPRESSA Kitchen Faucet with Pulldown Spray was modeled after a vintage wine chalice. It is a traditional style faucet mixed with clean lines. This faucet comes in a variety of finishes including stainless steel, polished nickel, polished chrome, and oil rubbed bronze. It has a vintage modern appeal and looks beautiful in a variety of traditional and cottage-style kitchens. In the Facebook Live video, the EMPRESSA Pulldown faucet in an oil rubbed bronze finish was paired with the bold and spicy Alta Mora Etna Rosso table wine. The warm, vintage, and earthy vibes inspired me to create a more rustic farmhouse mood board. Worn finishes, galvanized metals, bark rimmed coasters, and recycled wine bottle glasses make up this beautiful and approachable home bar design. The EMPRESSA Bar Faucet has a sleek and compact design. It is smaller in stature and works well in more compact spaces. It offers all of the same advantages of the Pulldown faucet only in a smaller package. The EMPRESSA Bar Faucet in polished chrome paired with a Pinot Grigio reminded me of a crisp and cold glass of wine enjoyed on the beach! I chose a coastal home bar design for this pairing. 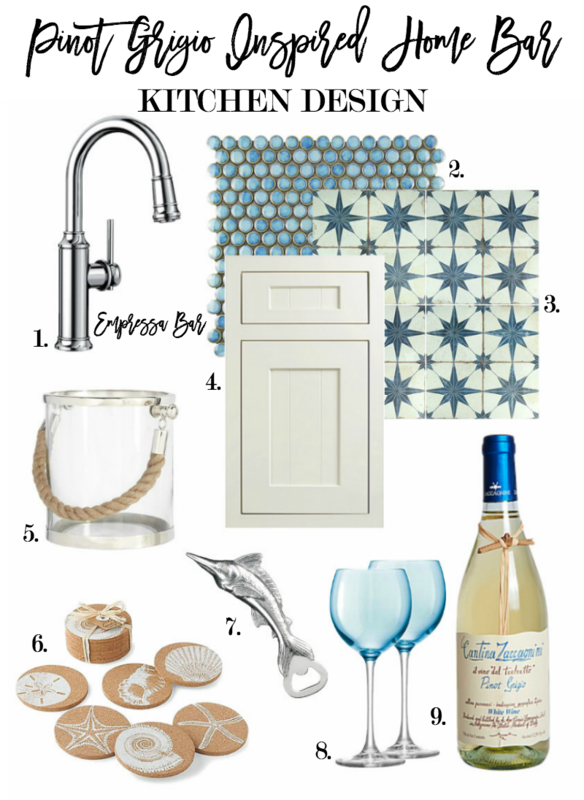 White beadboard cabinetry, blue penny tile backsplash, star tile flooring, and coastal bar accessories work together to create a wine inspired design that feels like a vacation. Ready to design your own home bar or kitchen? 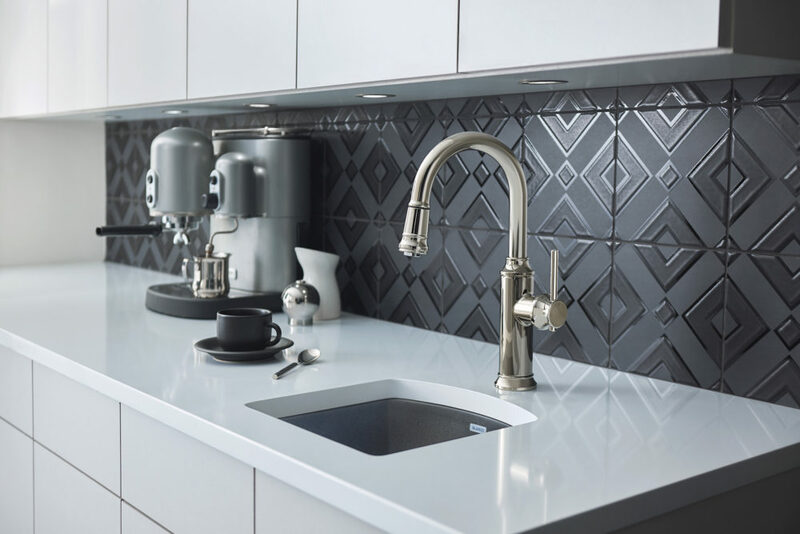 Check out more inspiration from the BLANCO EMPRESSA Faucet Collection here. You may also like to see more kitchen design decorating tips here. This is absolutely GORGEOUS! So much kitchen inspiration. LOVE the wine pairings. Thank you! It was fun to create!